SUMMARY: As the Internet has moved through the dot.com boom and bust (and the more recent waves of Web 2.0 and social networks), and integrated software encases the activities of many people and most organizations, the dynamics of hierarchy have begun to morph into a new dynamic called wirearchy. 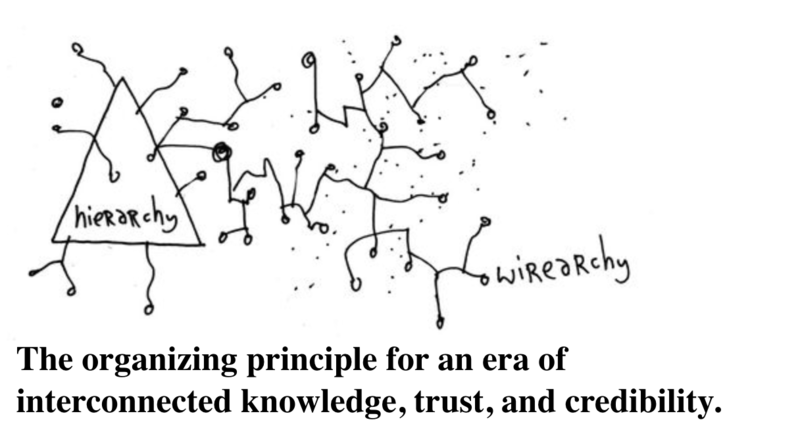 Wirearchy is a dynamic flow of power and authority, based on information, trust, credibility and a focus on results, enabled by interconnected technology and people. We have long understood that “knowledge is power.” Knowledge in and of itself is non-hierarchic, as Peter Drucker notes in The Economist’s Survey on the Next Society (November 2001). However, gathering and using knowledge to do things, to create results, requires context and decisions. Creating context and making clear decisions requires effective structures and processes of governance. Hence, as human society evolved through successive eras of new ways to distribute and use information and knowledge, it has become understood that those who able to gain and control access to critical knowledge were able to acquire and/or create power. Knowledge is power. Let’s look at history for just a moment. For example, if we can loosely accept the definitions above as chronological, long before the printing press and widespread distribution of the printed word knowledge and power resided with the “royalty” of the church, the monarchy and their court, and those chosen by these small groups of people to stimulate and participate in the control of society. The rest of the populace were busy farming – on the royalty’s land – and making clothes and shelter in order to survive the rhythms and forces of nature. Fast-forward several centuries. With the discovery and invention of new forces and technologies such as the printing press, electricity and the steam engine knowledge began, primarily through the connected networks of the powerful elites – the royalty and the clergy – to spread around the world, albeit ever so slowly. Having access to knowledge, funding its sources and guarding and/or controlling its distribution created a integrated system of power and authority. We have learned of the many attempts to control the mass populace through famous stories such as the Spanish Inquisition, Braveheart, Joan of Arc and many other such examples. Always, these stories have been about attempts to resist and control change that sprang from informing and catalyzing popular movements. There has always been the attempt to control and shape knowledge through the restriction of media and dissidents – and this continues today, although in more subtle and sophisticated ways. Fast forward once again … to the dawn of the Industrial Age. Collectively in the emerging industrialized world, while managing our way through world wars and the re-shaping of important colonial empires, we learned how to build the infrastructure of what we all know today as the modern world – roads, highways, factories, suburbs, downtown cores of larger and larger cities. The demise of colonization and the last vestiges of traditional control, for example in Africa, India and South America is a relatively recent phenomenon. In the last half of the Twentieth Century, there has been an ongoing move off the farm, through the factories and suburbs, and into the offices of modern urban centres. This growth was accompanied by the spread of scientific management and the rise of the professional executive and manager – the Industrial Age equivalent of royalty and clergy. Hierarchy as the dominant form of organization became encoded into the structure of virtually all institutions of society during the Twentieth Century, mainly as a necessary condition to support efficiency and productivity. Frederick Winslow Taylor has become famous as the father of time-and-motion studies, as the ongoing drive for productivity and efficiency was born in the early 1900’s. Tools and techniques such as division of labour, organization charts, and job evaluation evolved into standard management instruments, and were applied to most forms of organized work activity. Today, paradox is everywhere. Those of us old enough to grow up in the 60’s and 70’s knew a different world, a world in which conduct and behaviours were much more homogenous – roles were clearer, and we knew how we were expected to act as we grew up and moved into adulthood. The movie Pleasantville, released in 1999, gives us a graphic representation of this unfolding of today’s paradox .. as diversity and access to voice have increased, so has the complexity we encounter in the course of our daily lives. The film’s narrative arc morphs from a homogenous, monotonous black-and-white “Father Knows Best” type of family, work and community life to a rainbow-hued juicy diversity of passions and (seemingly) outrageous behaviours. Pleasantville’s “hierarchy” – the mayor, the police chief and their cronies – feel threatened and attempt to control this emergent celebration of life through reining in the perpetrators – to no avail. Now, as the Information Age has become firmly rooted, we’re moving through living rooms and offices out to the world on the Information Highway – and the ways we use the raw materials and interactive rhythm and pulse of this Information Age are transforming our social structures and behaviours. And as a result, a lot of turbulence, ambiguity and uncertainty are being created for us. Many of the structures and forms we use to carry out human activities, such as schooling, shopping, cooking, working and entertainment, are “wired”. The next generations of families, friends and workers are growing up surrounded by electronic tools, digitized images and information, and have been connected to the World Wide Web since infancy. Hierarchy’s “command-and-control” is transforming into as-yet not clear forms of “champion-and-channel” and we will all have to learn how to live, work and manage in this new form of organizational dynamics. We’re beginning to build wirearchies where hierarchies stood, and there’s no going back. The characteristics are becoming clearer more quickly than we are learning how to behave – not surprising given the ways that mental models shape our perspectives, beliefs and behaviours, as Peter Senge reminded us in The Fifth Discipline. We need to move from stability-based predictability, power and control to an ongoing flow of flexibility, integration and innovation. So…what do you do as a leader and as a peer in the Knowledge Age, when past traditions of always gaining rungs on the professional ladder by being the smartest, the most decisive, the clearest, and the strongest may no longer work or result in resistance and cynicism? What do you do now, when perhaps previously much of your power and clout came from your position, but you may not have much more information than many of the others in your organization or market? What do you do when suddenly, many people in your organization, and many of your customers and competitors are loaded with that same information? What happens when there are a number of people just as smart or smarter .. and more talented than you .. wanting to do what you want to do ? You may no longer have privileged access to information, other than through keeping secrets or manipulating information – which may come back to haunt you? How do you “unlearn” your old mental models? How do you need to communicate and behave in order to establish credibility in this interconnected Knowledge Age? The Internet and the World Wide Web burst into mass human consciousness only 17 or 18 years ago ;-). Their reach and penetration have multiplied exponentially since then. And yet, this dominant defining factor of a new era is only in its infancy. The accessibility and interconnectivity they provide already responds to almost any need or desire, and much more capability seems sure to emerge in the next five to ten years. Also, Web-enabled tools have begun to transform work processes in ways that are important and pervasive. Even though the dot-com boom has come and gone, workplace integration and human resources management applications are proliferating. Very large enterprises such as MicroSoft and Oracle, SAP, PeopleSoft, IBM Lotus and others have ‘updated’ the market for productivity and knowledge-work software’, encasing virtually all organizational activity in software. There are too many workplace and business process applications to catalogue, and new more integrated, easier to use versions or competitors appear on the horizon every few months, while new integrated services emerge and jostle for attention and marketplace acceptance. Similar initiatives and dynamics are now underway in a large cross-section of society’s organized activities. And, there has been much push-back and significant resistance to accepting the need for fundamental change. Yet the tide of integration keeps on coming, inexorably. And ‘clouds’ of cloud computing are overhead and on the near horizon. Much of what the average worker sees of this is through the daily communion with the computer screen on her or his desk. They access the software with which they work and communicate with other employees through portals, of some form or other. As we learn more about how to integrate all growing software-based capability into our daily work lives, we will see various forms of employee portals, partnership portals, project management portals and, eventually, comprehensive real-time enterprise computing applications take root and grow in many organizations. Organizations’ IT infrastructures, coupled with ongoing growth in the scope and use of smart software, will create a type of integrated nervous system, providing top management and workers with an improvement-and-learning focused feedback loop. When software connects customers directly to business processes, and employees have “line-of-sight” responsibility for making a clear contribution or directly impacting business results – when most of an organization’s strategy and value proposition is directly coded into its CRM, ERM and B2B applications, will the types of supervision and management we learned in the ‘70’s and ‘80’s continue to be effective? There’s a very real issue here that is helping to create the emerging dynamics – the more that work activities are encoded and embedded into integrated systems, the more the human will and spirit needs to surface, assert itself, and make it known that the multi-coloured diversity of Pleasantville is here to stay. The proliferation of information technology, business process re-engineering and wrenching changes to established business models created by the rapid development of the Internet are exerting significant pressure on long-standing business hierarchies. Top-down, command-and-control management structures and dynamics struggle to maintain effectiveness in the face of free-flowing streams of content-rich information, coming from all directions. The dynamics of how people relate – to work, to markets, to bosses and to each other – are changing. “Wirearchy” – a dynamic flow of power and authority based on connections and conversations, is emerging as a social dynamic in both business and society. This emergent organizing principle is an informal but pervasive emerging structure of governance, strategy, decision-making and control based on knowledge, trust, meaning and credibility. Things get done and results are achieved through the interplay of vision, values, connections and conversation. Wirearchy is generated by an open architecture of information, knowledge and focus, enabled by connected and converging technologies. It suggests a fundamental change in the dynamics of human interaction in – and with – organizations of all sizes, shapes and purposes. It also represents an evolution of hierarchy as an organizing principle and dynamic. Wirearchy will not render hierarchy obsolete, nor the need for direction and control; rather, it will render them more necessary. However, it will change the meaning of those terms and how they are used and experienced. People won’t accept authority easily any more. While old-guard keepers-of-the- keys still cling to authority and power, the older models of how to lead and follow are unravelling. Organization charts are still useful, but only as they become more fluid. Certainly, they appear in a much wider range of shapes than before, and often convey new messages about power, status and control. “Organigraphics,” or pictures of the ways organizations flow and operate, are clearly more pertinent, accurate and useful, according to strategy and organizational structure guru Henry Mintzberg. Perhaps the shift to wirearchy is a result of the conflict and dissonance generated by dated structures, mindsets and dynamics clashing with the irrevocable new forces created by the open access to information and knowledge. An early scenario (.. almost 15 years ago now .. ) describing this change is found in The Cluetrain Manifesto (www.cluetrain.com). It describes how fundamental shifts in values and attitudes due to connections, openness and cynicism demand openness, transparency and authenticity from the prevailing power structures in our corporate-led society. How do today’s leaders, managers, employees and freelancers respond to these forces? Clues are evident in initiatives emerging in the fields of customer and employee relationship management, organizational development, human resources management and organizational change: The use of techniques such as scenario planning, dialogue, open space, 360 degree feedback, emotional intelligence, coaching and mentoring have all grown significantly over the past several years. Together, these soften the rigidity of outmoded structures, and help people respond and adapt. Most organizations carry out ongoing initiatives to create, clarify and improve capabilities in each of these emerging areas. Indeed, a large percentage of the global consulting industry is focused on diagnosing, developing and implementing strategies for these goals. Wirearchy is significantly different in that it focuses on the structural and psychosocial dynamics generated by interconnectivity and access to knowledge. It begins not only with what’s happening at the top, but also what’s happening in the roots and branches of an organization. Where hierarchy created focus and meaning through the control of knowledge, wirearchy implies that the control and use of knowledge acknowledges and involves a much wider range of stakeholders.. It will take time and experience in this new era to know what “success” and “effectiveness” mean and look like. In a wired and wirearchical world, where there is literal meaning in the phrase, “everything is connected to everything else,” we will have to watch, learn and imagine how to lead and manage in ways that foster ongoing growth in human development. As the forces that are creating it grow, this organizing principle – Wirearchy — will impact business, governments and societies in ways that we have never before encountered in human history. Positing an organizing principle for the interconnected, networked Knowledge Age is aimed at understanding and shaping a new organizational dynamic for the benefit of individuals, organizations and the societies in which we work and live. It’s giving a name to a new organizing principle that reflects more realistically and accurately what’s going on out there, and we believe that this principle should be used to create work structures and cultures that respond authentically – with speed, flexibility, integration and innovation – to customer needs. “Wirearchy” – a dynamic flow of power and authority based on connections and conversations – is emerging as a social dynamic in both business and society. The definition suggests a fundamental change in the dynamics of human interaction in – and with – organizations of all sizes, shapes and purposes. It firmly suggests the necessity for the evolution of hierarchy as an organizing principle and dynamic for the networked era. The new conditions do not render obsolete the need for direction and control; rather, what changes is the meaning of those terms and how they are used and experienced. Wirearchy is a structure of governance, strategy, decision-making and control based on trust, meaning and credibility – things get done through connections and conversation. Preferred futures .. choices about direction and response … are generated from an open yet structured social architecture of information, knowledge and focus, enabled by connected and converging technologies. Work will keep changing faster and become more uncertain, more precarious, and more focused on delivering results. Work will become an ever-flowing combination of the necessary results delivered by people using their unique combinations of skills, personalities and motivations – the mass customization of work. Mass customization was defined and popularized by Stan Davis, a leading organizational and business thinker, and suggests that standardized products and processes can be adapted – customized – to the specific needs of small groups and or individual preferences and needs. It’s clear that the spread of this concept during the 90’s throughout manufacturing and service processes is now being followed by its penetration into the nature of work – the more work activities are standardized, the more the preferences and needs of small groups or individuals assert themselves and demand satisfaction. This changing nature of work has been brought about by the ongoing penetration and spread of computers and ever-smarter software into virtually all areas of human activity, notably work activities. Where control of information, knowledge and thus power used to reside in the hierarchical structures built to manage work in the Industrial Age, the changes to work that we are experiencing demand that knowledge, power and control are shared, diffused and distributed. Thus, the new organizing principle – Wirearchy – is required to help us make sense of the consequences of our new conditions and the structures that are being born in response to these conditions. New models and new ways of doing things are clearly necessary. Symptoms of this need are cropping up all around us – from new approaches to leadership and the recognition that issues like Emotional Intelligence and team work are responses – not always well-designed or implemented – to the need for effectiveness in any organized, organizational endeavour. We see and live a 24/7/365 work and life, we experience increasing degrees of artificial intelligence in the form of chips and software built into almost everything humans do, and local and national economies are buffeted by global markets and global competitiveness. The established forms of governance, leadership, management and citizenship are under attack from all sides, and new ways of addressing these critical issues are appearing in the current affairs and business news every day. In addition, the types of organizational structure that can accommodate the necessary responses to ongoing change generated by interconnected markets and constituents are changing in front of our eyes. Much has already been written – and more will follow – about networks, partnerships, and strategic alliances. Competitors regularly partner, or form strategic alliances with a third party where their main competitor is the third party’s other main, and equally important, strategic alliance. In the face of this often confusing and paradoxical landscape, leaders and managers everywhere are searching for tools and techniques that will allow for continued effectiveness in the face of swirling change. Often, the working assumptions they use to guide their quest is based on the traditional mindset – eroding in effectiveness in plain view – that controlling the playing field, being right and minimizing the risk of not knowing and denying or shutting down flexibility and openness, is what will show to their masters – most often the capital markets – that they are decisive and know what to do. The trouble is…it’s really hard to create and achieve sustained success when working from ineffective or unaware mental models. It’s been well-documented, for example, that the average lifespan of newly appointed CEO’s grows shorter and shorter each year. Why is that? As unrelenting change and the spread of interconnected distributed knowledge continues to grow, the structure and shape of organizations and work also continues to evolve. More and more work takes shape in time-and-results defined projects, and the presence of teams and teamwork is ubiquitous. Out-sourcing and contracting, as organizational responses to carrying out critical work and tasks while limiting the impact on the core operational aspects of an organization, are widespread. The flattening of hierarchies has also been a common response – and yet the legacy mindset and dynamics of hierarchical command-and-control are still dominant – even though at the height of the dot-com boom it seemed that the dynamics of the “geek revolution” might forever replace traditional power structures. A unifying, organizing principle will help greatly in coalescing meaning and sense out of this swirling morass – exploring, defining, and explaining what is observable about Wirearchy will be an essential first step in moving forward. Jon Husband is currently a Strategic Advisor with several high-tech firms, and a workplace coach and futurist.